WASHINGTON, Sep 7 2013 (IPS) - Between concluding rounds of negotiations towards the Trans-Pacific Partnership (TPP), a major U.S.-proposed free trade agreement, a divisive fight has heated up over the extent to which countries should be allowed to regulate the sale of foreign – potentially far cheaper – tobacco products. In duelling proposals offered during the latest round of negotiations, in Brunei late last month, the United States and Malaysia put forward starkly different approaches. While Washington is urging that tobacco products be given no special consideration, the Malaysian government has countered that these items should receive a special “carve-out”, exempting them from a broader lifting of trade restrictions. Now, critics of the U.S. proposal are hoping to emphasise the health implications of these proposals ahead of the next 12-country TPP talks, slated to take place here in Washington starting Sep. 18. The administration of President Barack Obama had initially hoped to have a final agreement text by October, but that now looks extremely unlikely. 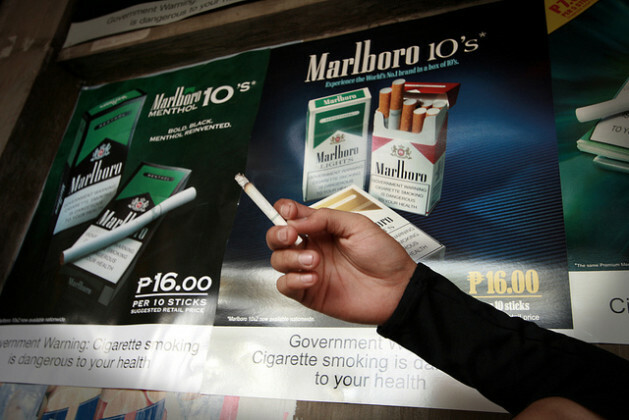 “Under other trade agreements, tobacco companies are currently using their investment provisions to attack public health regulations,” Arthur Stamoulis, director of the Citizens Trade Campaign at Public Citizen, a Washington-based consumer watchdog, told IPS. New York Mayer Michael Bloomberg, a long-time proponent of greater tobacco control, recently suggested that the U.S. proposal could directly contribute to “tens of millions” of deaths globally. The potential results of the U.S. proposal are fairly clear, with repeated evidence going back to at least the 1980s. For instance, according to findings by the Government Accountability Office, the U.S. Congress’s main watchdog, after international tobacco companies moved into South Korea in 1989, teenage smoking increased fourfold within the first year. Advocates of tougher restrictions are warning that the U.S. scheme would be particularly dangerous to developing countries. Not only could the proposal open these economies to potentially cheap cigarettes coming from other countries, but it would also make them vulnerable to expensive litigation from powerful tobacco interests if these countries try to impose trade restrictions. Smoking rates in the United States and many other developed countries have come down dramatically in recent years, in part on the back of a unique wave of international agreement about tobacco’s deleterious health effects. Indeed, the world’s only international health accord, the Framework Convention on Tobacco Control, which entered into effect in 2005, has been ratified by 176 countries – including each of the dozen in the TPP negotiations, except for the United States. Yet smoking rates are rising in many developing countries. With tobacco use having led to roughly 100 million deaths during the last century, experts now estimate that it could cause upwards of a billion deaths this century – more than 80 percent of which will likely be in developing and middle-income countries, according to the World Health Organisation. In the TPP negotiations, the new U.S. position rescinds an earlier draft proposal that included an exemption for tobacco-control measures. Instead, the new proposal simply recognises that countries are allowed to put in place health regulations, similar to other treaties. It also offers a compromise of sorts. If any tobacco-related trade dispute were to arise due to the imposition of health-related regulations, health officials would be encouraged to engage in consultations before any settlement process goes forward. The U.S. Department of Health and Human Services has signed off on the new proposal, with the agency’s deputy secretary, Bill Corr, stating that the “proposed language … will make a difference for tobacco control and public-health efforts”. Yet such provisions still constitute a “retreat … and fail to prevent tobacco control measures from being challenged as violations of trade agreements,” according to Susan M. Liss, executive director of the Campaign for Tobacco-Free Kids, a U.S. advocacy group, reflecting similar sentiments recently expressed by several U.S. health associations. Indeed, not only are countries such as the United States and Australia currently fighting lawsuits brought by tobacco companies against various tobacco-control laws, but such suits are increasingly being aimed at developing countries. Uruguay, for instance, is currently battling former tobacco giant Phillip Morris over a law that requires particular packaging for cigarettes. “Developing countries are particularly at risk from these trade rules and challenges simply because they do not have the financial and legal wherewithal to defend against trade suits brought against governments,” the Center for Policy Analysis’s Shaffer says. Although tobacco no longer makes up a large percentage of the U.S. economy, pressure on the Obama administration surrounding the TPP negotiations has come from business interests worried about a “slippery slope” effect – that an exemption for cigarettes would eventually lead to additional exemptions for a range of other products. The U.S. Chamber of Commerce, the country’s largest business lobby group, has been increasingly vocal in recent days on the TPP tobacco proposals. “[We risk] opening Pandora’s box by setting a precedent that others will try to follow for additional ‘unique’ products in ways that could be very damaging to American workers, farmers, and companies,” John Murphy, the Chamber’s vice president for international affairs, wrote last week.